Medical Ministry International has partnered with Empower Global by supporting their work at the Haiti Medical Clinic, also known as “Jehovah Rapha,” which provides basic medical services to the community in which it operates as well as serves as a base of operations for a number of Healthcare services onsite as well as in various remote areas. We are supporting the clinic by supplying the nurses and staff with new scrubs and uniforms. We are also supplying eyeglasses and eye charts for the clinic and healthcare training programs that are offered by Empower Global to 20 churches. Last, we are supplying Empower Global’s new Sewing School with fabric materials for the program. There are 24 students registered for the 2019 program. Once the students are adequately trained in sewing and tailoring, they will receive business training to operate a small business with access to space and machines onsite to develop their businesses. Haiti is a Caribbean country that shares the island of Hispaniola with the Dominican Republic to its east. It has an estimated 10.8 million people. Chronic instability, dictatorships, and of course, natural disasters in recent decades have left it as the poorest nation in the Americas. More than 90 percent of the population are extremely vulnerable to these natural disasters. The Republic of Haiti comprises the western three-eighths of the island of Hispaniola, west of the Dominican Republic Haiti is positioned east of the neighboring island of Cuba, between the Caribbean Sea and the North Atlantic Ocean. The climate is tropical, with some variation depending on altitude. The rainfall pattern is varied, with rain heavier in some of the lowlands and the northern and eastern slopes of the mountains. Haiti's dry season occurs from November to January. 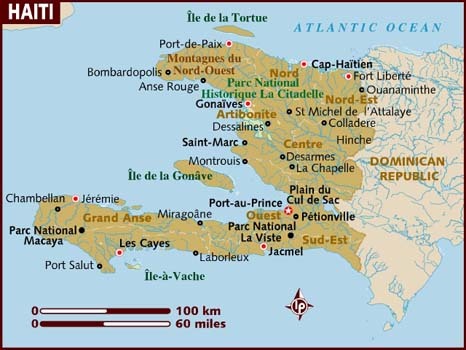 Haiti shares land borders with Dominican Republic, and shares maritime borders with Jamaica, Cuba, and Bahamas. Haiti is the most mountainous nation in the Caribbean and its terrain consists mainly of them interspersed with small coastal plains and river valleys.